They take care of me. And I take care of them. I alert them every day when some men enter the territory. Well, nearly every day. Five days in a row, then they take a couple off. They’re as regular as clockwork. They pretend to be building something behind the house across the street, But I know they’re just waiting for a chance to come in and steal the TV. A couple weeks ago, he was gone for a few days. She let me sleep on the bed with her. When he came home, he was very tired, so we slept on the bed for a few hours. Then, I had to wake him up. It took some work. But I finally got him up by dancing on his chest. Those guys across the street pretended that their truck was stuck in the mud. There was this gigantic tow truck in OUR DRIVEWAY! I went nuts! He got up and looked. That scared them away. And one day, I encountered the guy who comes six days a week to the house. He’s some kind of stalker. Just hangs out for a minute at the little metal box they attached to the porch. Completely creepy. Anyway, she and I were out walking and this stalker guy was walking the other way. I played it cool until he passed us. Then I lunged! Another six inches and he would have had a hole in his pants. He still stalks us. Maybe someday I’ll get another chance. Let him be aware. I am watching. Then there was the BIG adventure. He said he had this pipe in the basement plugged up so nothing could crawl into the house. But this particular creature of the rodent variety gave it a go. I found it under the stove, and when he lifted the stove, that thing jumped right into my mouth. It surprised me so much I dropped it. But I was quicker than it was and made short work of it. It was all over before she realized what the horrible racket was all about. Good thing, too. He called me “Killer” a couple times. But, shucks, I was just doing my job. He figured out which pipe was the problem pretty fast, and he told her what he would need to buy the next day to fix the problem. She told him Lowe’s wasn’t closing for 15 more minutes. He had plenty of time to fix that problem that day. They were so happy with me. They invited me up on the bed that night. I stayed there a bit. But it was crowded so I went to my own bed. I’m not really different from who I was when I arrived. But she has changed some. I overheard a conversation she had with a neighbor. She said she had never understood the “dog people” before. But now she does. The neighbor misses the dog who used to live there. Gone a few months now. She is sad for the neighbor. I taught her that, she said. We don’t always understand each other. But they’ve caught on to my cues about when I need to go out. We have a nice routine. We are flexible about it when we need to be. They’ve learned where I like to walk–to sniff, to leave my own scent around the territory. They see that my territory goes beyond what they consider theirs. Yet, they set boundaries. I can’t pee on these light up devices other neighbors have in their yards. They haven’t been up all year. Just recently. Seem fine for depositing my scent. But they say no. For some time, they didn’t understand why I would get up on the bed and lie on his spot right before he got in at night. He was away again last night. So I crawled onto her spot. I waited there for awhile as she got ready to sleep. But that’s when she understood. She saw I was warming it up for her. Welcoming her to her own place. To her rest time on a cold night. She is more now because I am here. That is really Cute! I really enjoyed that. Thank you for writing today! Bark, Yap,Yap, Woof,Woof, Woof, Woof, GRRRRR, Yip, Yap, Woof, Woof, Bark, Bark, Bark,Bark, Yap,Yap, Woof,Woof, Woof, Woof, Bark, Bark, GRRRRR, Yip, Yap, Woof, Woof, Bark, Bark, Bark,Bark, Yap,Yap, Bark, Bark, Woof,Woof, Woof, Woof, GRRRRR, Yip, Yap, Woof, Woof, Bark, Bark, Bark, (Lick, Sniff)!! I’m much more of a cat person than a dog person, but this is really cute! Thank you, Bill! God bless! Sorry to hear about your loss, Paul. God bless and thanks for reading and commenting! How cute! It’s so funny to wonder about what goes on in those brains! I actually have another one. Will post soon. Boomer is my sons’ dog and he visited during my son’s deployment. Thanks for commenting! God bless! What a lovely article. I am a sucker for anything to do with dogs, in fact, my own little one is still curled up on my bed snoring like a drunken sailor – I’m told it has to do with her pug nose. Anyway, lovely way to start the day, thanks! Thank you! Enjoy your pup. God bless! nancyehead you have a vivid imagination! You are also a wonderful story teller. Thank you, Jeanette! God bless! Thank you, Marcie! Sometimes, you just have to laugh! God bless! Love it! I have 2 dogs that keep me going. If only I knew sometimes what they are thinking. Me too! God bless, Marilyn. Thanks for commenting! This is really sweet! Dogs love us so well! Thank you, Bailey! God bless! I love pets. 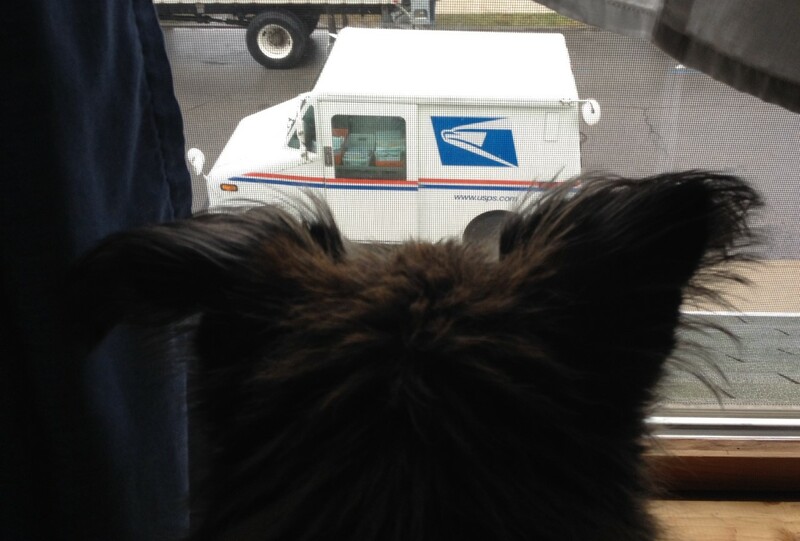 He seems to like the mailman. He really just didn’t trust the mailman. He didn’t understand why that guy kept coming around. Thanks for reading. Happy pet times! God bless! Hi Nancy, I love reading stories when written from different points of view(in this case a dog). Very creative and well written. Thank you for sharing. Thank you for reading, Monna! Planning to post a follow-up piece on Monday. Stay tuned! God bless! Adorable and intriguing to read. So much fun to hear it from the dog’s perspective. The way you set up the story to reveal you’re only now warming up to the dog and understanding dog people is delightful. I thank God for the dogs that share the property so I don’t miss my late fur kids as much. Welcome to a while new level of love!